The entire basis for this book is that a young man named Candide is taught by his Professor Pangloss that “this life is the best of all possible worlds. ” He tries to remember that as he goes through life after getting kicked out of his patron’s castle for making amoré with (?) Miss Cunegonde, the daughter of his patron. After this he and a couple of regular companions travel through a bunch of countries and scenarios (a picaresque) experiencing enormous hardship searching for Miss Cunegonde. 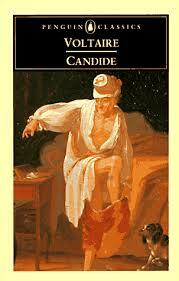 Pangloss is thought to have been executed but Candide travels on. The situations are bizarre and hilarious. Pangloss’ philosophy is a hole pile of sheep BS. This is painfully obvious from the whole woeful tale, but because that was a part of the philosophy of Voltaire’s times in the wonderful age of “Enlightenment,” the book created a scandal. Nevertheless, it’s also been very widely read and touted ever since. I have nothing at all new to say about it – go read it and enjoy. I didn’t really get much more out of it in this reading because some of the allusions and references are to things which have been lost to the 18th century – or beyond my knowledge anyway and it’s heavily historical in the way classics, especially satires, tend to be. I enjoyed it too. It was such a fun read. You bet, fun is a good word for it.